I'm trying to build a controller for a 5 wire resistive touch screen using one microcontroller's digital outputs interfaced with some transistors (currently trying a solution using BJT). My objective is to allow two out of four of the touch screen terminals to be supplied simultaneously so I can read a given touch position. In order to read a position on the X axis from left to right, where the output voltage Vo would be Vo=V+ (V+ being a positive reference voltage) on the right edge of the screen, I would need to connect RT and RL to V+ and LT and LL to V- (V+ > V-). I came up with a circuit that works fine with a single axis, but it fails to do what I intend when I insert the second axis control. The LEDs simulate the touch screen terminals, the switches simulate the microcontroller outputs, which will only be ON one at a time. 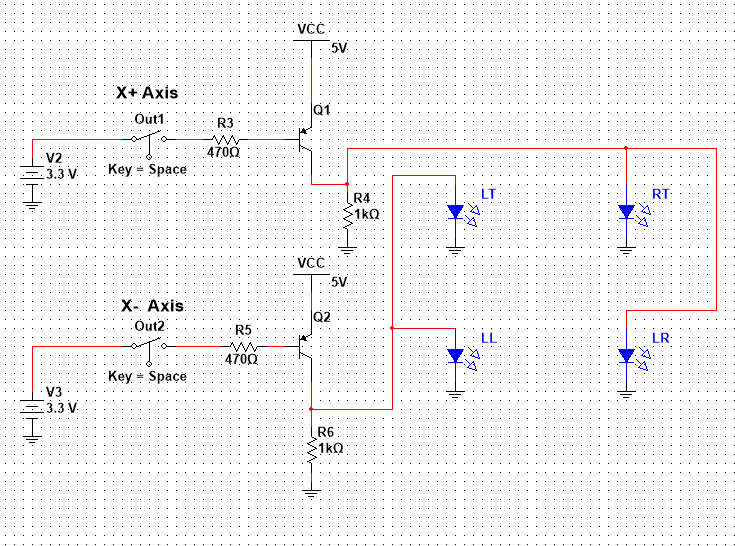 If I replicate the same circuit for the Y axis, all the LEDs will be ON, obviously... I'm struggling to come up with a circuit to disable one of the axis' control circuits in order to let the other be able to work. Any ideas or suggestions will be more than welcome. Browse other questions tagged microcontroller touch-panel resistive or ask your own question. How to isolate the microcontroller from power source?